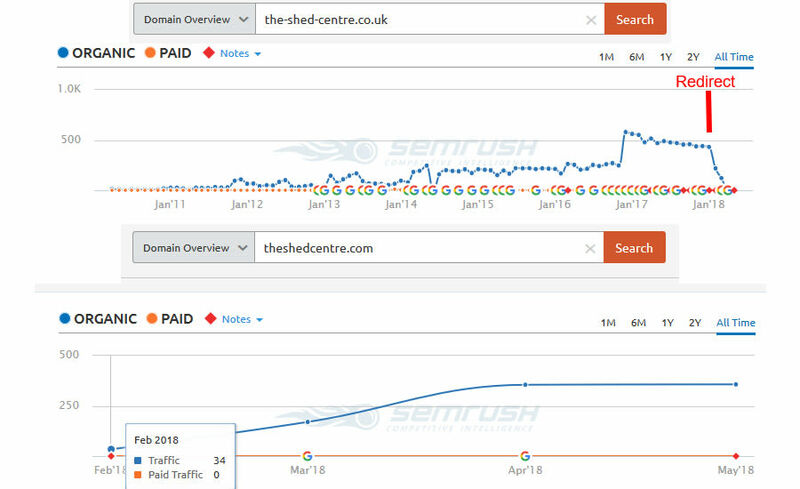 This ecommerce audit will look into the website for The Shed Centre (theshedcentre.com), offering a brief overview of how they might improve their search engine rankings, and sell more sheds online as a result. PS. If you want to know my full SEO audit process (far more extensive) then read my post on it here. Redirected Domain – Traffic Drop? Now this website has only recently been introduced, previously being www.the-shed-centre.co.uk/ which has since been redirected. As a domain name with dashes isn’t ideal, I presume they were always waiting for this more brandable domain to expire / come up for sale, which is a good move as long as this new domain isn’t penalised. However just because something “seems” to be a good idea, doesn’t always mean it is. When checking SEMrush, we can see that before the redirect, the old domain received roughly 440 visits per month, and now even after a few months, the traffic of the new domain is around 350 per month. Could it just be a slow transition? Or is something more pressing wrong with the domain? Only time will tell on that one, but because the home & garden niche busiest period is March -> August, it may have been a better idea to plan this transition for a downtime, such as September, where a traffic drop could’ve been less influential on ecommerce sales for that year. Key lesson: avoid big site changes or migrations that could influence traffic over your busiest sales period. There are some fundamental on page SEO issues with the website that need to be fixed. The glaring issue on the homepage is the lack of a H1 on the page. 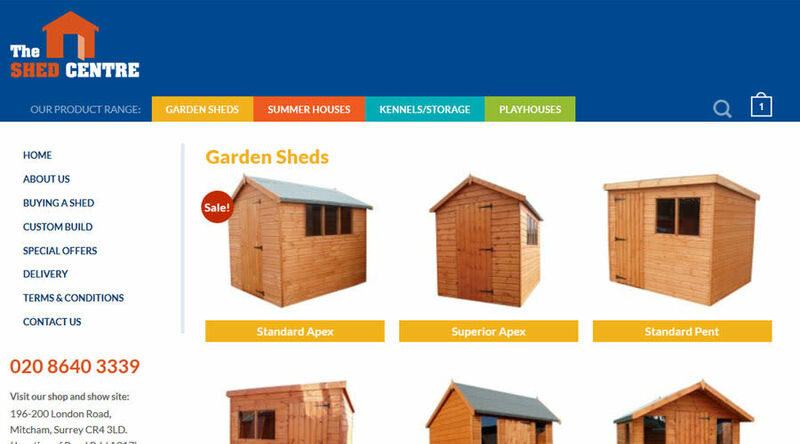 The homepage also has a very long Page Title that should be shortened to focus on the core keywords – Garden Sheds, Buy Garden Sheds Online, Garden Sheds for Sale, Garden Sheds UK, etc. These contain a range of our core keywords, and show the customer that it is a site where you can buy online and get home delivery. You can test the lengths of your Page Title using a SERP preview tool (loads of free ones available, just Google it). There is also a lack of breadcrumbs on the site, which limits the internal linking. They have the breadcrumbs schema.org code implemented but the links are missing from the page. This is bad for Google and for users looking to navigate. The category pages just contain a list of products, with no supplemental text or information to help them rank. They also don’t have optimised page titles (using the default woocommerce Archive title) and have no meta description. To learn more about how to structure your category pages click here. The domain is “theshedcentre.com” which means that they are inherently targeting the term “garden sheds” with their homepage. However they also have a product category called “garden sheds” which represents a cannibal of the homepage. As the homepage will receive the majority of the links to the site, the category has almost 0 chance of out ranking the homepage for that term, and I would recommend that they delete this and redirect it back to the homepage. If the page is useful for users, then considering changing it to “all” or something else that’s less keyword targeted would also be acceptable, but the garden-sheds url should be 301 redirected back to the homepage first. You can read more about what keyword cannibalisation is on my post here. Apart from the central index implemented mass local directory links from the previous domain name redirected through, the website itself has virtually 0 quality referring domains. This is a massive problem, as links are the number 1 ranking factor in Google, and should be front and centre of their SEO efforts. Even spending a bit of money on some high quality UK based business directories could really improve the rankings of this website for their core keywords. Even though these products are high value, with delivery and build services + high costs on the products, the margin they are working with may be limited. However I think a minor investment in some quality SEO services to fix the issues identified (or simply getting someone in house to make the simple changes in WordPress) could go a long way to improving their rankings. 1 Redirected Domain – Traffic Drop? Thanks for this post. Good audit of the shed centre!